Gooood Morning! I hope you all had a great (Easter) weekend:) I wasn't feeling well but was lucky to have my mom in town. We're in the very beginning stages of planning my wedding, so watching Say Yes to the Dress and looking at wedding dresses online was some fun relaxation for us. Can you believe it's already April?! Its time to get out your mini skirts and sassiest sandals. Flirty folk-ish inspired looks are what I'm crushing on at the moment, and my favorite interpretation comes from Viviana Volpicella. My favorite street style interpretation comes from Viviana Volpicella, who has mastered the art of eclectic dressing like any fab Italian fashion editor. I love how she combined a pleated mini, embroidered blouse and sky high sandals but was able to maintain a harmonious look by staying in a red and pink color scheme. Other street style strutters have given their own go at the flirty eclectic trend based around a pleated statement skirt. If you're really daring go ahead and mix it all from a bright patterned skirt to sequins galore to a vest. A more refined way to channel a flirty eclectic vibe is by keeping colors simple and mixing a full patterned skirt, simple silk tank, and strappy stilettos. And have no fear, if pleats aren't your thing a printed circle skirt works as well. I love that first look! I'm not sure I could ever pull off anything like that, but it would be fun trying! 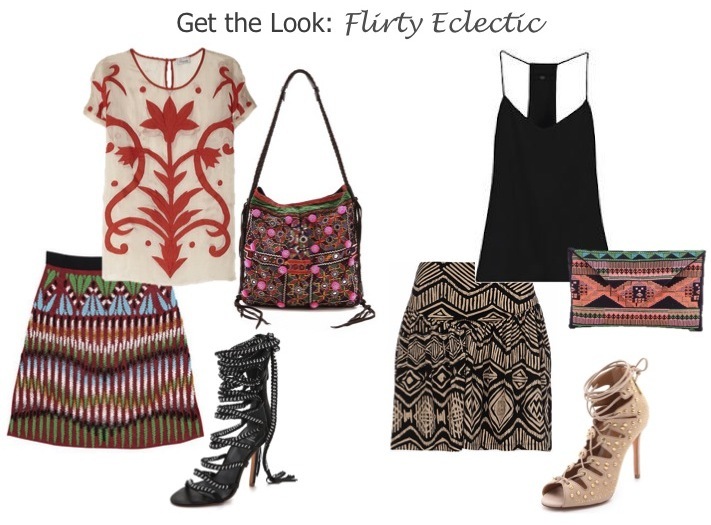 Love that aztec printed skirt! I could definitely see myself rocking that this summer! Excuse Moi!!? That first look is out of control!!!!! So perfect. I really wish I could buy that Alice Temperley top! So gorge. This is SO amazing! I love the outfits! so inspiring and cute! Loving that black aztec print skirt! I would totally rock that! Maybe spice it up with a colored top! Just stumbled across your blog! Check out my new post about Glamorous Office supplies, and a discount code for SHOP the Office Stylist! Viviana has amazing style and I love this outfit inspiration!! I love the tribal feel of these prints! High waisted pleated skirts are my spirit animal. LOVE them. Great pics for this post lady! This trend is SO good!! Win a pair of AG jeans on the blog! fabulous! love the first outfit...killer...and your two round-ups are so good...of course the more expensive one is my fave...isn't that always the case? I love these looks!!! Anything flowy for me for summer is perfect!! I'm having my first giveaway on my blog and would love you to enter when you get a chance!! I just love me a flirty skirt! I'm especially digging Viviana's outfit in the first pic--those shoes! My word!! Seriously, these are three of my all time favorite looks! Loving the wrap sandals too! I really enjoy reading your blog!